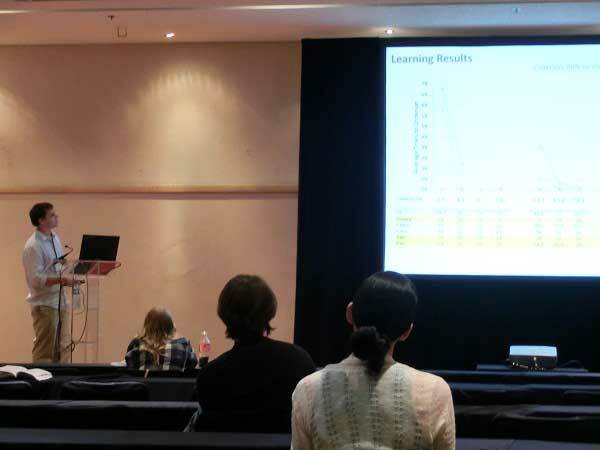 I gave an oral presentation at the 24th Congress of the International Primatological Society in Cancun Mexico. My presentation was entitled "Cooperative problem solving by chimpanzees in a shared numerical sequencing task. " The talk consisted of recent research that I conducted with the chimpanzees of the Primate Research Institute, Kyoto University, focusing on a novel experimental apparatus that enabled pairs of chimpanzees to engage in collaborative tasks on a shared touch-panel screen. The IPS congress provided an opportunity to introduce my new experimental apparatus, tasks, and findings to an audience of experts in the field of great ape cognition. In addition to giving a talk, I also attended daily plenary talks as well as many sessions on topics in primatology such as cognition, group behavior, development, captive welfare, and conservation. I was also able to meet with several zoo researchers to discuss collaborative projects we are currently engaged in, as well as future research possibilities. Delivering talk on my research during a cognition session.